When Wild Garlic flowers its flower heads are a real lacy beauty to behold. Not only are the flower heads delicate and powdery white, whilst standing tall on its green stemmed leg to me wild garlic flowers look almost like stars bursting from a firework sparkler. But I cannot ignore its pungent smell. 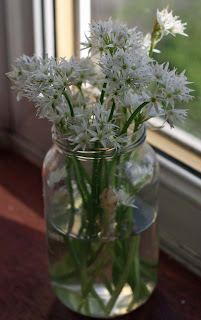 These chaotically arranged Wild Garlic flowers (in recycled jar) have been stinking my little flat up the past few days. 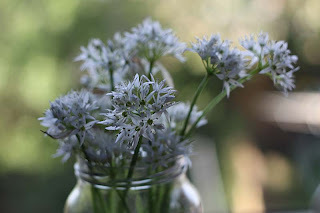 Still I can't grumble too much, I've enjoyed eating the leaves, stems (chopped like chives), tight slipper buds and now the star like flowers (as garnish) that are beginning to blooming. If not picked these gentle white stars will begin to fall. Still working my way through ideas I fancy. The garlic macaroni cheese was nice. Shall do that again - and might add the sorta adaptations I like - like twice as many ramsons/some sliced tomatoes on top/some breadcrumbs on top...that sorta thing. Next up - not one of yours this time - but I shall try some ramson leaves steamed in a saucepan with a little butter and served with a squeeze of lemon juice on top as a side vegetables. So pretty. Such a useful plant. Funny your working through wild garlic ideas here, I am still going through another fresh batch. So pleased you liked the garlic macaroni cheese and that it worked out better than the focaccia. I like your suggestions on how to adapt, I am all for changing a recipe to suit your own tastes. I like the simplicity of your steamed wild garlic recipe. I think it would be lovely tossed in some new potatoes. You are so right Sue. Other than its use in desserts, it is so versatile. :) Mark - Who would buy it?!. Thank you so much Astra. I'm glad you feel that way as i do have a few more to share before the month is out. I very much like your wild garlic posts. I am not a forager ... yet. It seems so romantic and I like living vicariously. Good idea to pick your wild garlic flowers and eat in salads. If you let them go to seed they will spread everywhere. Your right about the seeds. I guess thats why they call it an invasive plant/weed.